You know the car guy commercials that come on in the middle of the day between episodes of Jerry Springer? Unofficial Law #0 of content marketing–don’t be like that guy. Why? Besides the obvious reasons, you don’t have to throw money into general ads and cross your fingers and hope for a response. Instead take the smarter route and move your business towards content marketing. The term content marketing can mean different things to different people, but broken down to its simplest form it means creating something cool that your leads will love, such as blog posts, podcasts or online videos. The ultimate goal of content marketing is to trade something really, really cool like ebooks, white sheets or other high quality downloads, in exchange for a lead’s email address. Once you have that, you can send them all sorts of things via email all the while gently nudging them towards a buying decision. Traditional marketing on the other hand, focuses on sending out a quick 1-time sales message. If people don’t buy right away, then that’s a good chunk of money lost. Content marketing works to create a connection, so if a lead doesn’t buy right away it’s not really a loss. You can send them more information as time goes on that may help convince them to buy. Content marketing can grow your business leaps and bounds–if you know its special sauce, or as we like to call it, the 5 content marketing laws. There are 2 things you need to ‘get’ when marketing with social media. 1. Social media has an ultra short shelf life. Be sure to diversify where you’re posting (Facebook, Twitter, etc.) in order to expand the reach of your content. And not only that, you need to keep up with social media in order to get it to work for you. With Facebook in particular, the less you post and the less fans engage with your page, the harder it is to get them to see your content. It’s a vicious cycle. 2. Content is always top dog. In the world of online marketing, content is the head honcho, the big cheese. Social media, email, and PPC ads should be used to get viewers to your content or lead generation pieces. Cutting out website content creation and just posting on social media will result in fans not having anywhere to progress to in your marketing funnel. They will only ever be Facebook fans, and fall into the dreaded lead limbo. SEO is important to the success of your website. But sounding like a weird robot programmed to only regurgitate popular SEO phrases is going to kill your conversions. Even if you’re ranking first on Google, if your content isn’t relevant or engaging to readers, they’re not going to keep reading. Find out what your customers want, and learn how they like to digest and share information. Then design your content especially for them. Lastly, garnish your content with SEO to help it get to the right people. Content marketing is a way to connect and engage with leads and customers. It isn’t a way to sneak in a straight-up sales pitch. Content marketing can be an excellent way to gently guide leads into your sales funnel, but only by focusing on building trust and credibility via education, engagement and expertise. What problems your leads are having. What they want to see more of. How they like to consume information. By having a solid plan for your content, you’ll be able to save some serious time and money in the long run. There are millions, literally millions, of websites fighting for attention. And by always following the rules and doing what everyone else is doing, your content will disappear into the background. You can grab attention by putting out unique types of content or finding out what your competitors are doing and do it better. Even something as simple as just being yourself and letting your unique personality shine through content can take you a long way online. Content marketing isn’t going anywhere any time soon. Business owners are seeing that content marketing allows them to get more leads into their funnel for a fraction of the price of traditional marketing. Not only that, it allows businesses to connect and engage with leads on a much more personal level than ever thought possible. Now we want to hear from you! 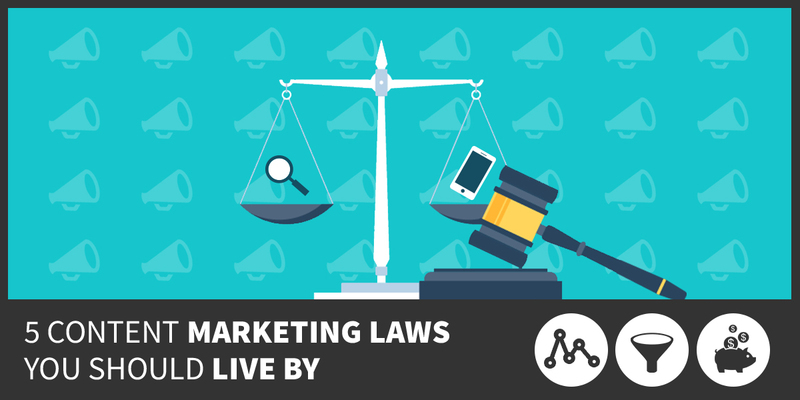 Do you have any content marketing laws of your own? We’d love to see what you have to say in the comments below.